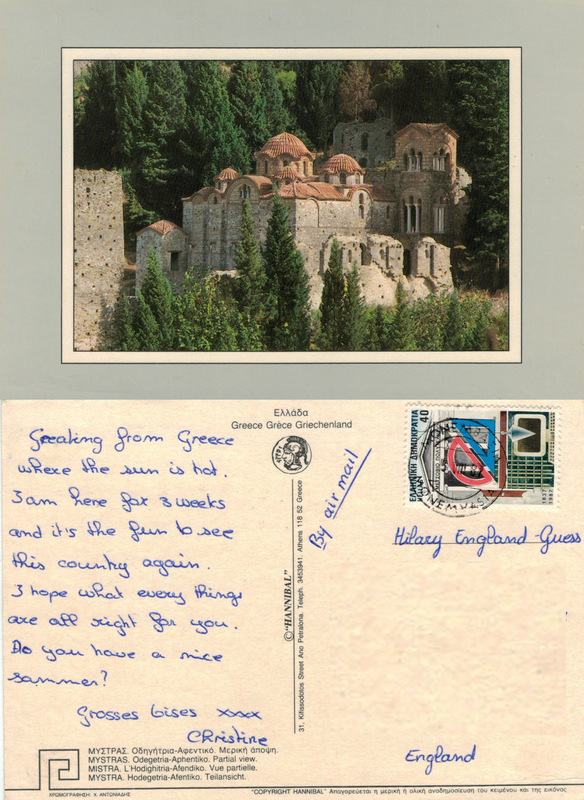 Postmarked Monemvasia 5th August 1987, this card shows a partial view of Mystras, the thirteenth century castle built near Sparta, which is now a World Heritage Site. The stamp is one of a series of four commemorating 150 years of higher education in Greece. This is another card from Swiss Christine who continued to work in and travel to many countries – it was always exciting to receive her postcards. This entry was posted in Friendship, Postcards, Travel and tagged ancient, friends, Greece, history, Mystras, Norway, Swiss, travel, UNESCO, World Heritage Site. Bookmark the permalink.